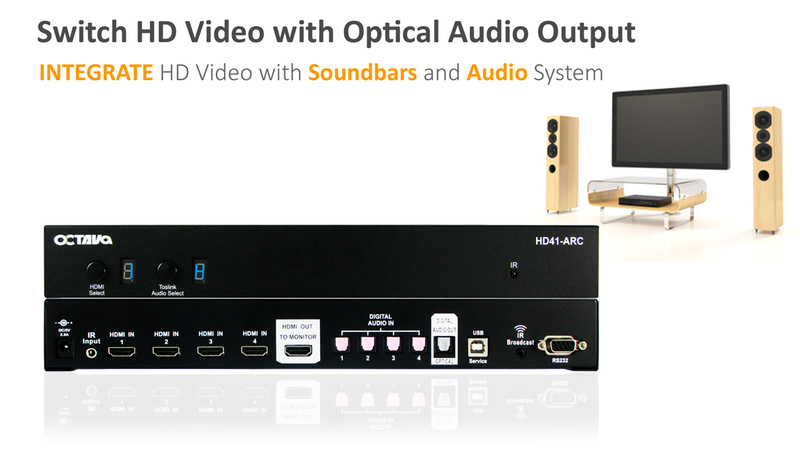 The Octava 4x1 HDMI switch +ARC is a complete HD video and audio switch solution designed to work with HDTV's with ARC(audio return channel) and your existing audio receiver system with Optical Audio Inputs. The Octava 4x1 HDMI switch +ARC includes: 4 HDMI inputs, 4 Optical Audio inputs, 1 Optical Audio output, 1 HDMI output with ARC support. 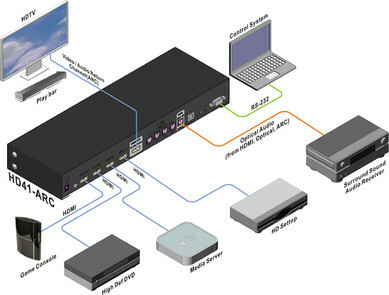 When used in the Optical switching mode, the Optical source can be independent from HDMI source selection. For example, you may view a video on the HDTV while listening to a different audio source via Optical Input. The HD41 has dimable leds. Watch your movie in the dark! Clear EYETM transmission line and ISI reduction design will ensure pristine digital video signal from source to display. Smart ScanTM algorithm intelligently selects the correct HDMI source so you can enjoy the program instead of fumbling with the remote. HDMI is backward compatible with DVI-D. This switch will work with either DVI or HDMI. We understand that you may have a "mixed" system and require different cables. We allow you to choose the type of cable that you need during purchase. Remote Control (IR) included. Discrete Code allows direct channel control.